There are different types of guns that a player can use for playing the paintball. Every person have their own preferences, and the experience level, budget and other factors also affects which gun they are going to use for paintball games. These preference also include some less important factors like the style, size, mechanisms that must be considered and checked carefully before having a paintball gun. Blow back, classic and mechanical guns are the most common guns that have been used since the invention of this sports, well known and mostly used by people, especially the beginner. 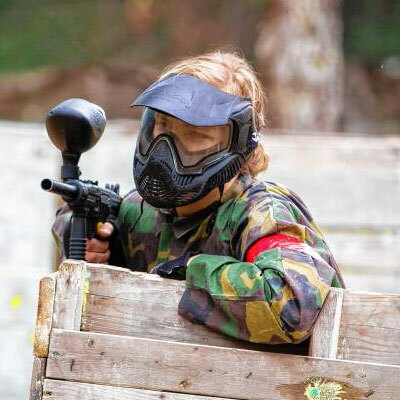 But now in this modern age when this sports has become more competitive, the invention of electro pneumatic guns which delivers high speed an advanced facilities, are being used during the high level paintball games. Most people new at this game don’t know the actual differentiation between mechanical paintball guns and electro pneumatic paintball guns and here in this article we tried to discuss the major features and differences and show which one is perfect for you. There are a few significant differences between the types of guns and many smaller differences. We will try to cover them all and at the same time, recommend the best gun for you. A mechanical paintball gun is completely powered by mechanical operation. The firing process is initialized by pulling the trigger and then a series of mechanical process causes the gun to fire and then reload again. The power to shoot the pellets is stored in the springs inside the gun and then the driving power comes from the expansion of the compressed air or carbon dioxide (CO2), whatever function that particular mechanical gun has. In an electro pneumatic paintball gun, the power for the gun to fire still comes from the expansion of compressed air, just like the mechanical one but the actuation of the firing mechanism comes from an electro mechanical actuator called Solenoid. When the trigger is pulled, instead of a mechanical connection, an electronic signals the solenoid which then opens up a valve to allow air to enter into the chamber to fire the pellets. Whereas the trigger pulled in a mechanical gun produces energy from the spring stored inside the gun, the trigger pull on an electronic gun releases electrical energy stored in a battery to actuate the solenoid. The basic is, one is powered by the spring, without any electrical operation and another is powered by the solenoid through the battery. One disadvantage of this electronic gun is that you must have to carry battery in your gun in order to power it up which means you must also regularly replace your battery, sometimes the whole gun. A second disadvantage is that the electronics are also very vulnerable to water damage. Whereas a mechanical gun can work in many conditions, including in the rain, electronic guns really need dry weather to perform properly. Apart from using condition and battery option, an electric gun is better from every prospective with higher fps and more accuracy than a mechanical one. There is one thing that limits the performance of a mechanical paintball gun, and that key feature is speed, which is a very important factor in competitive paintball. They are able to be fired relatively quickly, but the practical maximum rate of fire is around 10 shots per second which is far behind the speed of an electronic one. The mechanical functions are simply no match for the fire rate generated by a battery. At the same time an electronic paintball gun can fire considerably faster because its firing speed is determined by an electronic circuit board and powered by a battery. That can be adjusted to fire much faster than human can pull their finger. Different guns have different maximum rates of fire, but most electronic guns can fire a rate of around 20 balls per second, which is almost double of a mechanical one. Mechanical paintball gun doesn’t have the best reputation when it comes to consistency. It involves lots of things like hammers, different sixe of springs and the air flowed in the guns sometime varies. Most importantly, they have multiple moving parts which shake the gun each time it fires, and more moving parts means more chance of misbehaving of those moving parts which will eventually result in inconsistency. Mechanical guns, particularly ones that use CO2 to fire up the gun, have noticeable variation between shots. It is usual for a mechanical paintball gun to shoot at very different speeds between shots. A typical mechanical paintball gun may vary by as much as 10-20 feet per second between shots and the inconsistent shooting can result in accuracy drop and then eventually poor performance in the field. Electronic paintball guns are way more consistent in the field of firing speed. As they contain an electric solenoid, there are fewer moving parts which means the gun vibrates less chance of misbehaving. Also, the electronic solenoid is able to open and close very consistently between shots and the speed can be controlled. The end result is that electronic guns have very consistent shooting rate. Variation between fire rates in an electronic gun is very little which means more accurate performance for better gameplay. The speed of mechanical paintball guns is limited as it totally depends on the speed of person that pulling the trigger. If that person pull the trigger fast the speed will be fast. But there is no actual speed control system and a normal person can’t pull the trigger more than 4 to 5 times in a second. Some of these mechanical guns have speed up to 1 rounds per second which have the feature of circuit board that help the person to control the speed of firing. The firing mechanism of electronic guns are secure because they don’t fire more rounds which may injure or harm your body. So this is the best choice for entry level players as it is quite secure. These electronic paintball guns are secure but still banned in some tournament like the early level tournament which have some security issues so that new players don’t have to face more speed. These electro pneumatic paintball guns can fir more than 20 rounds per second which is really a fast speed for the beginner player and may cause any serious injury or harm to your body. So it’s best to use this gun when you have an experience of safety for both the teams. Electro Pneumatic paintball uses an electric battery which provide the electric energy needed for firing any paintball. So you need to replace the battery whenever the battery runs out of power. These types of guns are not also compatible in rain and other environment that can damage the battery of these guns. But you can use these gun safely for indoor environment. While on the other hand mechanical paintball gun don’t have batteries and use the energy of spring to provide driving force. So these guns are suitable if you are going for both indoor and outdoor environment and has no issue working as the spring work in the rainy weather as well as in the water. Cost of the guns is another key difference between a mechanical paintball gun and an electronic paintball gun. While there are some high-end mechanical paintball guns that cost in the hundreds of dollars, but those are exceptions. Most modern paintball guns that are mechanical cost less than $200. On the other hand Electro pneumatic paintball guns are more costly as these guns have the electric component that are not available in mechanical guns. Electronic paintball guns, though, generally cost close to $200 for the cheapest models and can cost considerably more, up to more than a thousand dollars, which is not budget friendly at all. Now, after we have discussed all the major factors concerning the difference between mechanical and electronic gun, it’s time we tell you which one would be the best for you depending on your experience, budget and personal preference. As we can see the most basic difference between this two types of gun is the way that these gun shoot their pellets. One of these guns are mechanically activated while the others uses battery power to shoot. Most important thing here while choosing gun is to getting your priorities straight. Your priorities and preferences are the major factors that will help you choose the right gun. First of all, from the power point of view, if you don’t want the hassle of changing batteries often and want to go to the old school way, then you should go for the mechanical guns. If you want a gun with most of the features automatic, and changing batteries is not a matter of concern, then you should get an electric one. In competitive games speed is really an influential matter and as the mechanical guns don’t have enough firing speed and it actually depends on the user’s speed of pulling the trigger, so it can be a major drawback. With the discussion of speed comes consistency and consistency of a mechanical gun is no match for an electrical guns consistent speed with a very little variation. If you are planning on playing in outdoor or in rough condition, rain where your guns battery can get damaged, you must choose the mechanical one as it is not vulnerable to any of these. And finally, budget is the last major thing to consider here. If you are on a tight budget, go for the mechanical gun which will deliver quite a good performance without breaking your bank and if you can afford that extra money you are always welcome to own one of those electrical gun. It really is all down to personal preferences, you should take into account being new to the game or whether you are an avid paintball player. Know your paintball gun before you head to paintballing. Learn the differences between the two types of markers and make choice which one suits you best for paintballing.